Ever make a recipe and think to yourself, “Boy that was good, but I think I can make it even better.” Such was my experience with these two zucchini soup recipes. But I guess two zucchini soup recipes is better than one! Especially when they’re both dramatically different. Enter the second recipe for a Thai zucchini soup with coconut milk, Thai basil and lime. This one was perfection from the start and not just because I love Thai soups. The coconut milk fulfilled my desire for something more rich and creamy. The Thai basil and lime created a nice contrast to the Italian basil and lemon in the first recipe. And the fish sauce, chiles and Thai aromatics truly made it unique (and classic Thai). It should also be noted that both of these zucchini soup recipes can be just as delicious when served cold. Zucchini is always best when it’s in season and that means during the heat of summer. 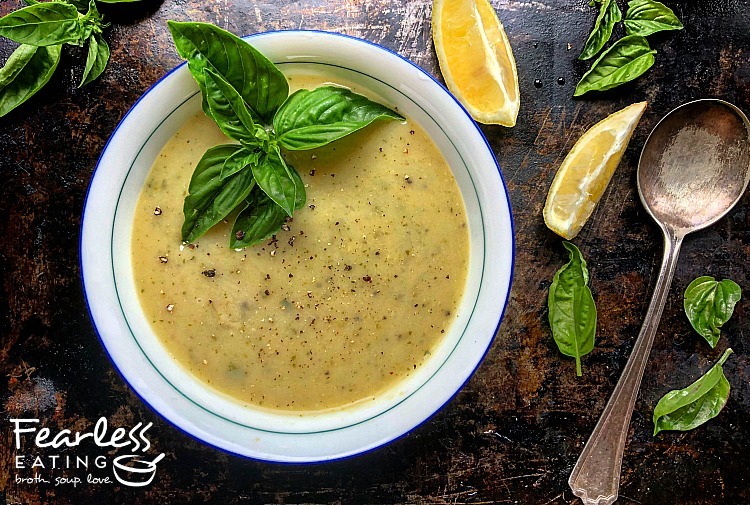 Hot or cold, lemon or lime, Italian basil or Thai basil, whichever of the two zucchini soup recipes you try below, you really can’t go wrong. 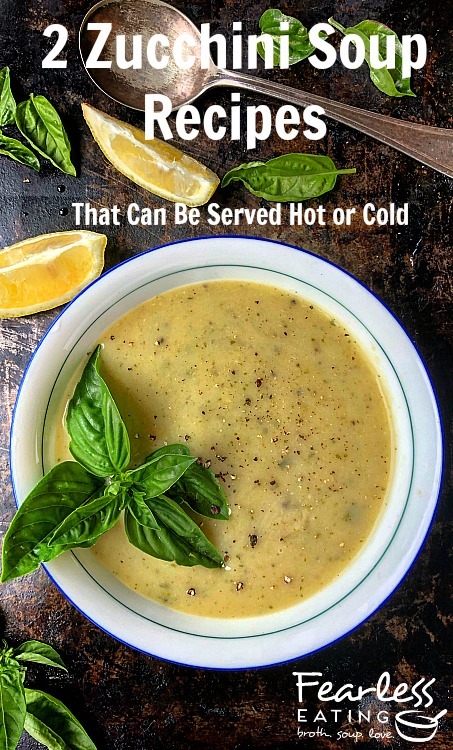 Served hot or cold, this zucchini soup recipe can be had in the middle of summer for a cool, refreshing meal or in the depths of winter on a cold, snowy night. 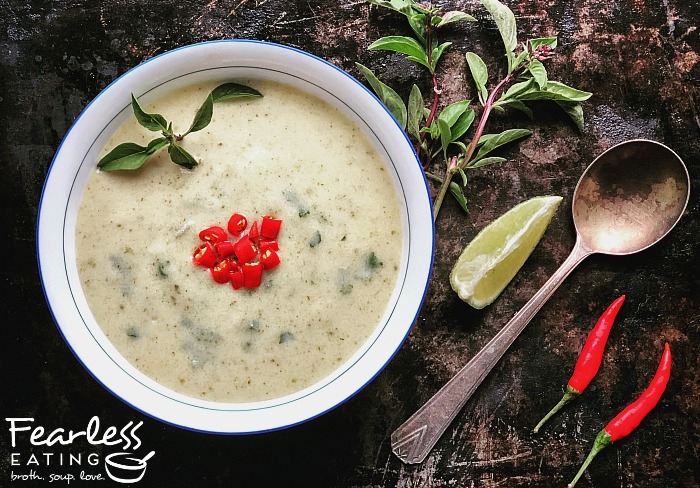 This zucchini soup recipe features a Thai twist with classic salty, sour and sweet flavors with ingredients such as chiles, lemongrass, lime and fish sauce. The coconut milk gives it all a rich and creamy texture as well as a nourishing sweetness. Melt coconut oil in a medium-sized stock pot over medium heat. Add onion and saute for about 5 minutes or until translucent. 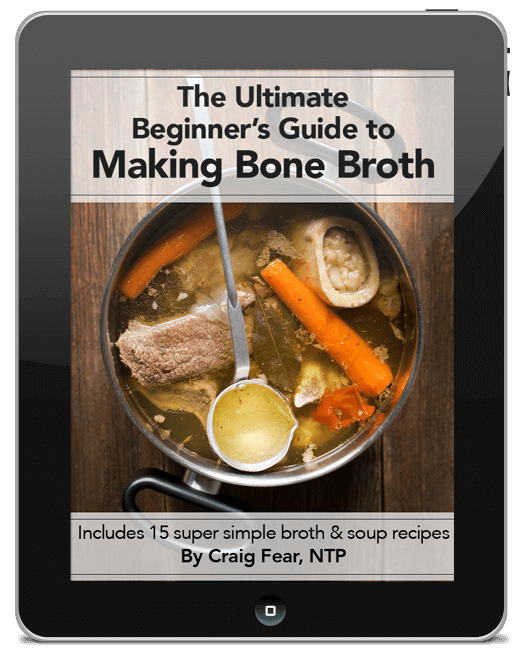 Add chicken broth and coconut milk, bring to a boil and quickly reduce heat to a gentle simmer. Simmer until zucchini are tender and cooked through, about 10 minutes. Add lemongrass, galangal, kaffir lime leaves and chiles and simmer about 10 minutes to infuse flavor. Add lime juice and fish sauce and taste, adding more, if needed. 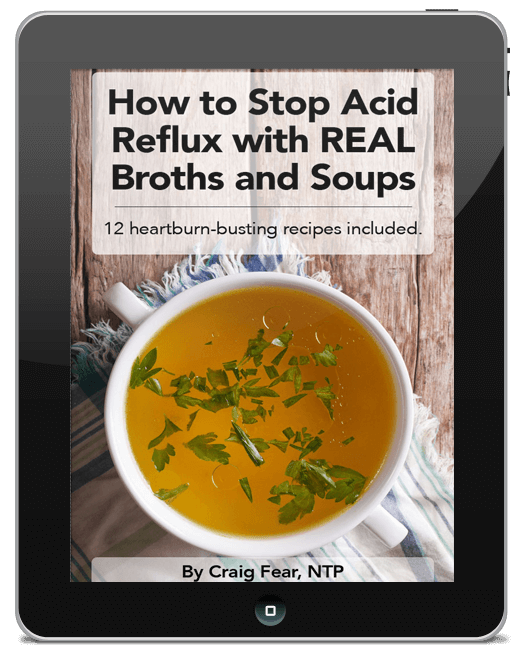 Serve hot or chilled and ladle soup into individual bowls and add any additional seasonings, to taste.